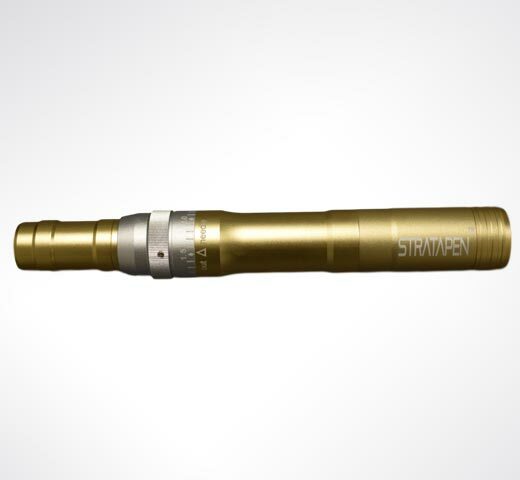 StrataPen is a minimally invasive microneedling device used for skin rejuvenation. It’s helpful for improving a variety of skin concerns such as wrinkles, scars, texture, laxity & more! StrataPen microneedling is safe for all skin colors and types. However, if you’re considering microneedling treatments, we recommend a cosmetic consultation first. We’ll discuss the different treatment options & determine if StrataPen would be beneficial for your unique skin! What is microneedling treatment like? We’ll start your treatment plan by taking photos of your skin. Next, your face will be cleansed and a topical numbing cream will be applied. Once your numbing period is done, the treatment will begin and should only take about 15 to 30 minutes. Upon completion of the session, aftercare will be reviewed and you’ll be given instructions for how to care for your skin. That’s all there is to it! What are the side effects of microneedling? Any downtime? First of all, microneedling is intended to be a minimally-invasive procedure. For most patients, the side effects & downtime are mild. However, experiences may vary slightly based on your skin type & the treatment settings. We recommend that our patients avoid sweat-inducing exercise for the first 12 hours post treatment. Sun exposure is also discouraged for at least 3 days post-treatment. StrataPen, like all microneedling devices, requires a series of treatments in order to get the best results. After each session, the micro-injuries we made to your skin will trigger a natural healing response. This can be described as a sort “remodeling” process. Your body’s own production of new collagen & elastin will create the most change.